A and friends consider the delicate balance they have achieved. The varied sized in the wood blocks make symmetry, and balance, a challenge. This particular story has been bumping around in my brain for almost two years now, though the desire to challenge gravity in various ways seems to express itself every year in my teaching experience. Something was different in the school year of 2013-2014 (my last year teaching in a half-day program with a morning and afternoon class). I've pored over photos and documentation from that year, and it seems to me that the decisive element was the presence of a boy *referred to as A in the documentation. Note: There were five children beginning with "A" in the morning class, and three "A" children in the afternoon. I soon regretted my choice of single initial for our shared digital documentation, but students were used to it and were quite happy to tell their families at home who all the players in their inquiry stories were. In fact, I took it as a sign of pride that students were going home, asking their families to show them the class twitter, and pointing out their stories: "No, that's not my building. Yes, that's it, see my shirt there?" Last year we decided to go with full initials, thus A in this story (who is now going into grade two in a few weeks), would be AK. There were other technical challenges as well; lost dates, problems with storify, lack of hard copy documentation (locked at school for summer). This post illustrates one of my favourite inquiry stories, but also gives insight to the process of collecting and reflecting upon the story. As I delve into my learning journey about documentation, I can't help but make my learning visible. I too, like A, am fascinated with structures that seem too precarious to stand still. I have long been a fan of a local balance artist, Peter Riedel (mentioned in previous posts here and here) whom I finally got up the courage to approach and chat with one day while he was at work on a beach near my home. I told him how I'd shown photos taken at the beach (over several years) to my students, and how an incredible inquiry unfolded (in previous years before A was in Kindergarten). I asked if he minded me using my photos and his on his website in PD, showing the beauty of exploring with loose parts. I am grateful that he welcomed the idea. 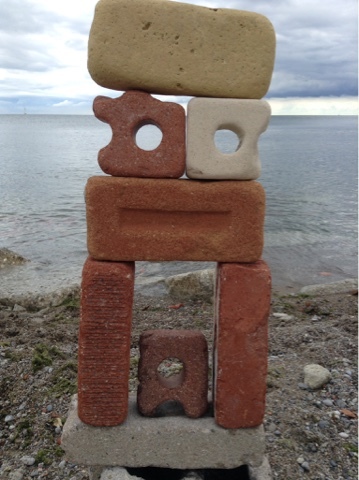 A treasure left on my local beach this summer by stone balancer Peter Riedel. I was delighted to find it, but sad I'd missed seeing it the day it was created. Often 15-25 of these sculptures appear, and over a few days some are knocked down (by large waves or more likely by human hands). When I found this one it was one of four remaining. My own rock play - not a gravity-defying tower, certainly, but the patience and perseverance required to balance the top stone gave me a thrill, when I managed to set it just so. 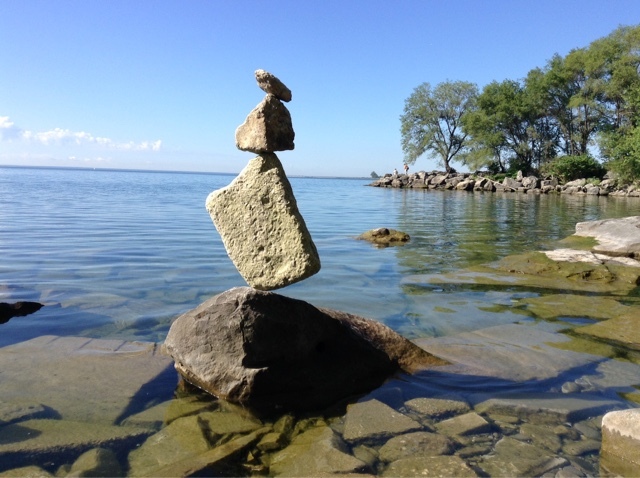 I think I may be "catching the balance bug" - I wanted to play here all day after a family swim last week on this very stony stretch of shore in Oakville. A structure inviting perspective taking - as I picked up the bricks to stack, I turned them in each direction to find the flat side, the slope, the holes. Peering through at each point gives a different view of the horizon and the waves. Students often relish the opportunity to include such elements in their structures, inviting their peers to look through this door, this window. In fact, it was discovering Peter on twitter last week that led me to revisit this story once again, after he suggested he could someday visit to do a demonstration. To say I was excited at that prospect is an understatement. I dug through old photos to find evidence of his impact upon my students. And so it is, re-inspired, I came back into this year-old draft and found the title, the captioned photo below, and seven point-form notes about what I intended to share (in blue). First week of school: R's recreation of one of the "Marilyn Towers" which we can see clearly from our schoolyard. My words intrigue me, now. Even my title seems like a lost story: was I thinking about how students found inspiration in great works of art and their own creations? Was it a reference to materials, both enormous stones and tiny beads or beach glass? 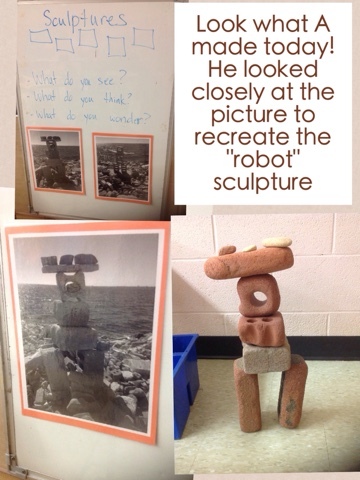 Was it a reference to "looking closely", so much a part of the culture of our class, and how students needed to both look closely and look from afar, in order to recreate those structures as challenged by their peers? I no longer know what made me think of the title, but I feel the need to honour it as part of the journey. There were so many inquiries ongoing in the last months of school: line in design and in nature, symmetry, mandalas, birds and bird feeders, spring change (#Kndspring), beyblades, potions, nature weaving, number patterns, and incredible caterpillar-to-butterfly experience. I remember being amazed at how often ideas from one inquiry would spin off into another, though the players were different. I see in the list I'd made those themes repeated: balance appeared in so many ways, and perseverance developed as students deepened their study of one or another idea through the use of their choice of materials. Reflection was apparent as students commented upon their peers' work, either finding solutions to their problems or finding inspiration for their own work. Most exciting was the way in which the morning and afternoon classes communicated with each other as they looked at the documentation unfolding from each others' work. There were other teachers, too. It was before our school joined FDK, but I was fortunate to have a fantastic ECE student join our class in spring. Daniel Kerr was much like my wonderful current teaching partner, Pooneh - an adult with a serious love of joyful learning and no fear of fully-engaged participation as a co-learner with students. Another player in the way the inquiry grew in the spring was Kelly Wright, an inspiring educator (and now friend) with an FDK class in nearby Clarkson PS. Our classes connected often through twitter, but it was her thoughtful action in April that transformed the building inquiry into an exploration of design and an exercise in critical thinking. As this is an old story, many of the photos from that year are assembled in albums saved in dropbox. I was able to find only the upload dates, and thus no timeline. Physical documentation in locked up safely in class, so my next step was a visit to "tweet tunnel" to find old tweets. The furthest I could go back was February 2014, so the earlier photos I found can't be dated accurately. These photos give some idea of how materials and ideas came into play over the year. A provocation from fall 2013: photos of large balance structures found in a park near to my home. Early on A demonstrated an interest in form, matching images and later seeking new inspiration in books we found together in the library. One of the reasons I so loved this inquiry was the way in which it allowed me to see A's true character. He had been my student for a full year already, but in his first year he was a quiet, cooperative boy who made friends easily and joined in a variety of explorations: a beyblade inquiry, a months-long marble-run project, indoor and outdoor cooperative games. He was not yet, however, a leader. What developed in A's second year of Kindergarten was his ability to follow his interest at great length - he was entirely happy to work on his own but equally patient when others wished to join in with his increasingly complex structures. A became a leader, though very quietly and without ever dictating roles. He demonstrated for me so very clearly the importance of embracing the theory of "the hundred languages". I had already begun to understand and relate to the theory through several other types of learners - those whose need for motion in order explore an idea, those who learned to use language later than their peers but whose mathematical understanding excelled early, those who were 'young' socially but full of ideas and mature expression when focused on their interests, those whose passion for nature made them comfortable and confident outdoors even if they experienced difficulty remaining calm while inside the classroom. These students who "stood out" in a highly-structured classroom, whose natural way of interacting with the world would be seen as "behaviour" when the student was required to do something difficult for them (such as lining up, sitting to listen to a story, completing a task such as putting on a snowsuit) were those I most delighted in seeing with fresh eyes, years ago when I first read "The Hundred Languages" poem. Students like me as a child, wearing my emotions on my sleeve and interrupting constantly when an idea popped into my head. But here was A, a well-adjusted student who demonstrated interest in many things but rarely spoke about it or asked to share his ideas, showing great maturity, creativity, and capacity. It must have been there, in the year before, when he explored similar ideas with his friends, all senior students. His parents laughed to hear how he was quiet, during that first year interview. They assured me that at home he was the one who told his older brother what to do. I missed it... had he been leading the play back then, or at least influencing the direction of their explorations through the materials he brought out to use? I cannot know, but what I do know is that through "listening" to his play, watching and asking questions and supporting his communication by taking pictures as he directed ("Now from here. Let me see. No, this part.") I witnessed something wonderful: A found his voice. Perhaps it would be better to say I heard his voice. An inquiry unfolded, crossed over into other inquiries, cooled down like a dying campfire only to have a spark catch anew... and A grew, and with him we all learned so much. As an educator I am greatly inspired by the theories of David and Frances Hawkins. I see how important it was for me to be present, if not actively involved at least actively listening and observing A at play. Some ways in which balance and symmetry came into play in our class that year: at top, A and friends on their "motorcycles", several late-in-the-year examples of balance structures, and at bottom left, an example of how an idea inspired an entirely different expression of balance in the afternoon class: body balance challenges. 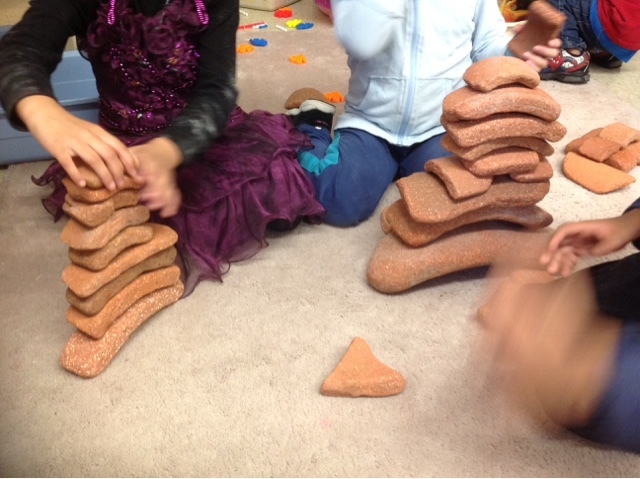 Several girls challenged each other to stack the clay curves in tall towers. J, on the left, counted each piece. N, blurry in the right corner, estimated the height of the two stacks in order to judge which was taller. I don't recall who mentioned it but there was a discussion about how they couldn't compare number of curves to decide which was tallest. The conversation gave me much insight into their understanding, as they pointed out side-by-side curves (thus not taller) and also the differing sizes of each piece. Math play happens everywhere in Kindergarten, but if you want to find it, go looking in the blocks and construction area. A structure by A and friends. Note the printed documentation on the whiteboard, at left. 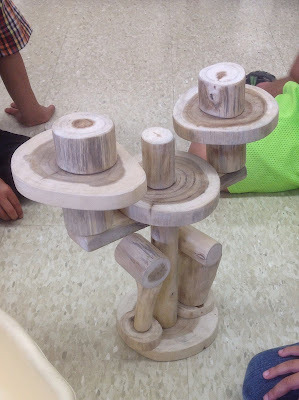 This places it sometime after April, as those images are messages sent to us by Kelly Wright's class, @KinderWonders during our collaborative inquiry around balance. That story is told in more depth below. Documentation by Daniel Kerr, made in collaboration with A. Note: due to another tweet by A on this day (see below) I know that this collage was from March 3rd. From the photos above you can see the patterns that had emerged since the beginning of the school year: play with symmetry (while using not perfectly-matched materials), balance, recreation of known structures, beauty, function and form. Below, reaching back as far as I could using tweet tunnel, I gathered examples of how A's passion for building, and in particular for balance, inspired his classmates and those students in the afternoon class. @FynesKs guess what, A. It fell down too! 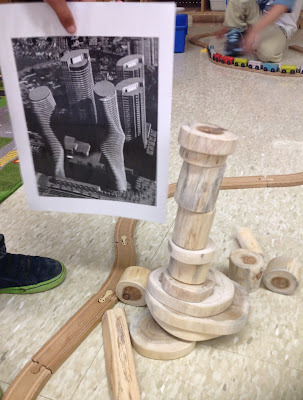 N says: "I can't build it anymore, but I can still use tape"
It was not long this time that I realized something big was unfolding in class and that I'd need to share it with families, beyond the tweets we'd been sharing all year. I started compiling a thread in storify, saved in draft. Now, before I can move on to that story, I need to offer an explanation, and a caution. Storify can be a wonderful tool, but it has limits. It is not able to reach back very far, like tweet tunnel (the examples above could not be found by using storify). It also requires a link for each tweet, which contains your handle (name) within. Herein lays the problem I encountered when I went to publish the story last year: when our class became an FDK class with two educators, I wanted to change the name to reflect this. My own name was the previous handle. I considered starting a new account, but this wasn't best for the families, especially those senior students who'd been with me while the account was called @FynesKs. Thus I changed the name on the active account. I only discovered later, when I originally went to publish the story, that my storify draft was no longer functional. It had a long list of these no-longer active links, such as: https://twitter.com/FynesKs/status/453243389396258816 (first tweet below). Last year I was disappointed to see the story disappear. I'm thankful that I didn't delete the draft. I saved it, more for the comments I'd added at the beginning of the story than for the now-defunct links. This morning I copied the introduction I'd written (see in blue, below), then got an idea... just as a test, I substituted "109ThornKs" in the link where "FynesKs" was. It worked. It meant tedious copying and fixing each link in a new window, but the story came back into view before my eyes. Here then is a window into that large balance inquiry as it grew over spring. An amazing balance challenge unfolds in our class. 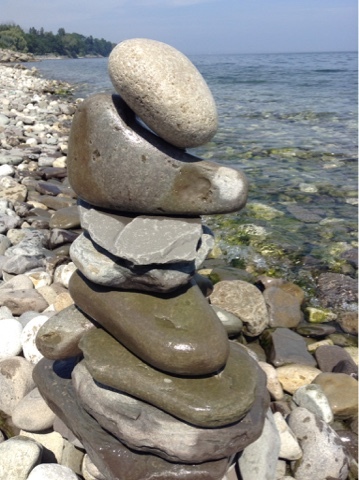 Balance is one of the big ideas we explore over the year in our class, and it shows up in many ways: body balance, testing materials, challenging one's self or working with friends. Students became truly proud, & even more motivated, when other classes joined in & challenged us to greater 'heights'. The balance and building work has gone on since September, with skills and ideas deepening each month. Storify won't allow me to reach that far back, so I pick up the story here, in early April, when my favourite clay curves (which had been sitting unused for over a month) were brought out by both my AM and PM classes on the same day. In the first tweet we were responding to class friend (an outdoor educator and coordinator extraordinaire) Rob Ridley, who sent a tweet to show he'd gone to visit the source of my students' beloved clay pieces (broken and water-softened clay pipe bits from a nearby foundary). @FynesKs Dear friends, we like your creation. We are going to try to build the same thing but with different blocks and colours. @FynesKs Hi! I'll show this structure tomorrow! They will be very excited to replicate this challenge with the blocks we have in the room! 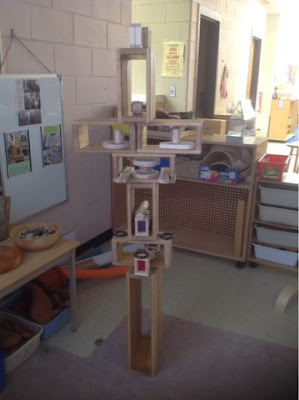 @KinderWonders that's a beautiful challenge, I wonder if we have the right materials. I'll ask the Ss what we have or what we need for this. @KinderWonders We tried today. It didn't work as we hoped but we had fun! M suggests: "Maybe we need beads that are big but small holes"
@MetcalfeDeCicco @KinderWonders we didn't get the print out in time to share but we noticed this on iPad: "angry birds! Cool!" @FynesKs We are making our own clay curved blocks to respond to your challenge! @KinderFynes 2/2 The four friends want to send you a tweet tomorrow of their 'balance ride'. 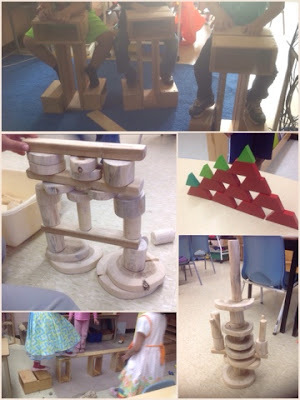 @KinderFynes Dear AM class, we like your balance challenges! One group has decided to make a balance for the rest of the class tomorrow! @FynesKs The friends at the blocks this morning "Wow! Cool!" We think they look like motorcycles. @KinderWonders funny, they ARE motorcycles! Good sleuths, K friends! @KinderWonders @FynesKs Some friends made another balance with 3 'stops' in the middle to play a game (I scribed). @FynesKs Wow! What great readers! We are glad you liked our tweet to you. Your class inspires us! We like your reading wands too! @FynesKs Our class liked the sharks! A. wondered "How many people were sharks?" J. asked "Did anyone fall in the water?" @BarbMcIlquham @FynesKs So true! The discussion and collaboration that took place within the play was so rich. Thanks for responding! A powerful illustration of the Hawkinses theories: eolithism, "messing about with materials", "I, Thou, It", and "Teacher as Learner"; science and math ideas are evident in deeply engaging, socially constructed play. Their desire to share with their families and friends in other classes made this a truly exciting inquiry. This image repeated from the tweets above. I look back at my original draft, my list of words and the title I left as a trace, and I know that how I see the story now is influenced by all the learning that has gone on since that time. I've been joined by a truly delightful, incredibly talented teaching partner, Pooneh. I've seen another year of students, (some who were in that class as year ones) tackle the challenge of balance in their play, many of those students inspired by the work that went on the year before. I've deepened my knowledge of the works of David and Frances Hawkins, through reading and discussions with fellow Hawkins-inspired educators. I am constantly amazed and delighted by the minds of the students I work with, and by those fellow educators, like Kelly, who embrace the wonder and thus make the classroom a place where magic can happen. Or, as I often say about our always-evolving (and let's be honest, not the prettiest, we're always catching up with our documentation) classroom, "It's not a beautiful place, but a place where beautiful things can happen". The tweet below, created and sent by a student very proud of her ability to write about her discoveries, says it well. and I wonder if it isn't a good metaphor for being teacher as researcher, learning from students through pedagogical documentation. To keep understanding, I must keep moving through the ideas. I must keep reflecting.